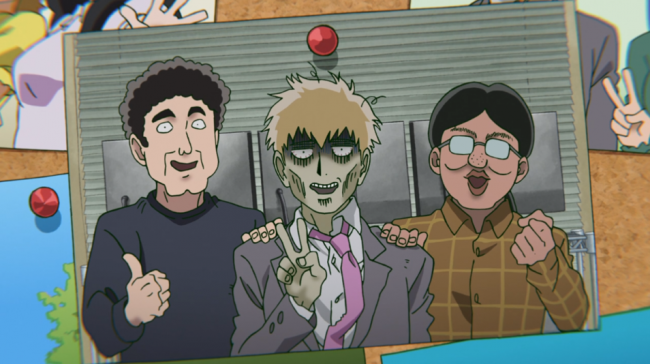 I’ve spent the last few weeks talking about how Reigen has been such a positive role model for Mob. How he, despite his eccentricities, was always pointing Mob’s moral compass in the right direction and looking out for his well being. 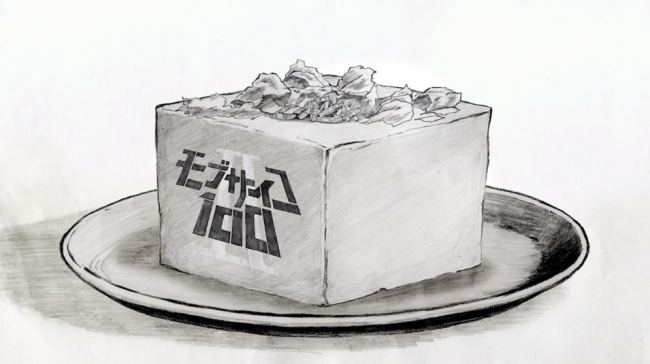 Well, this week’s episode decided to take a big old dump on that little interpretation of mine. This is the week Mob and Reigen break up. So this episode begins with Mob breaking his own personal push-up record of 35, and the fitness club all rallying around him, tossing him into the air in celebration of his accomplishment. Seriously, I love these guys. They’re a bunch of muscle heads, but they are so overwhelmingly positive and supportive of Mob despite his snail-like progress. They’re the best. After a bit of friendly ribbing between the telepathy club members (who still share the space with the fitness club), they all decide to go out together to celebrate Mob’s progress and gaunt nerd’s Birthday. Thus Mob finds himself in a social situation, with a group of peers who treat him like a friend. A strange and new experience for him. And as usual, it is interrupted by Reigen calling him for “training”. Only this time, Mob declines. Reigen uncharacteristically belittles Mob, assuming he can’t be doing anything important, because of course he is a social pariah. He pressures him into coming anyway, which Mob breaks down and does so. After the job, which is a relatively simple exorcism that mirrors the events of the first episode, Mob again asks that Reigen not call him on such short notice. And so Reigen begins spinning a tale, trying to manipulate Mob and convince him that people will only try to take advantage of him. Only this time, he is wrong. 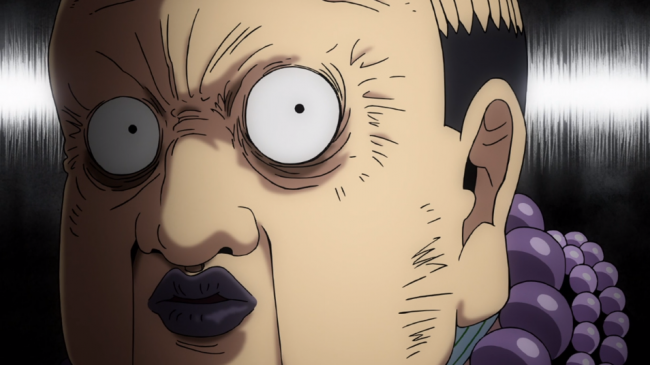 Mob has become surrounded with people who genuinely seem to like him for his efforts outside of his phenomenal psychic powers, thus Reigen’s great con is finally shattered. After this, the focus of the entire episode shifts onto Reigen, showing us how he quit his job as a water cooler salesman and jumped into the spiritual advice gig as a way to trick stupid people and make some easy money. It them jumps to the present, showing Reigen at the lowest of the low, having nobody reach out to him on his birthday, bar his mother who tries to convince him to get a real job. And he does, after a montage of him helping people who only think they’re in need of a psychic through yoga and MMO grinding, his popularity jumps through the roof. He finds himself on a talk show opposite a familiar face from his last big job. 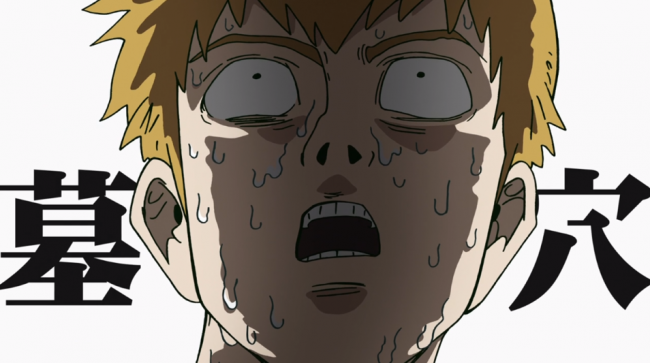 The episode ends with Reigen being set up to fail on public television. I’m going to avoid making a prediction about where this is going, because this show has managed to defy any kind of predictability on my part every step so far. Maybe we’re going to get some kind of character turn for Reigen, like Mob has slowly been having over the course of this series. This episode though, after the balls to the wall hype of the previous episode felt a little slow, its titular character mostly absent from large portions of it. While it had some laughs, it felt like it lacked the heart, the hype or the humour of the series thus far. As much as I like Reigen, his story doesn’t feel like it needs to be told. I hope the next part is a step up from here. Previous Previous post: Jojo’s Bizarre Adventure Golden Wind Episode 18 Review – Head To Venice!